Please, I know these cookies appear simple and might seem banal, but don’t underestimate the power of the lime my friends. 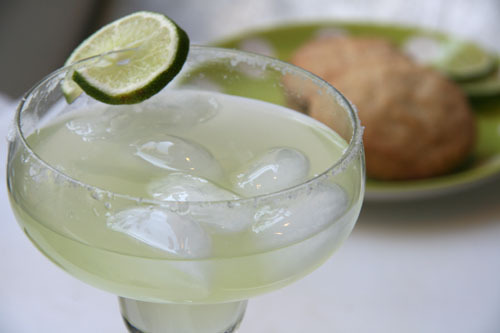 Afterall, what would a Margarita be without the lime? 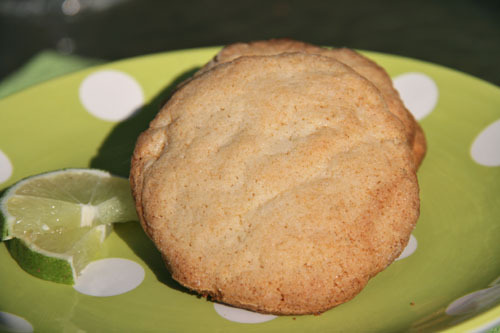 So lime + sugar cookie = zesty heaven. Trust me. There was never a truer equation except maybe lime + tequila + salt (and maybe a few other things) = salty heaven. Are you sensing a theme? So, when you are planning your Mexican themed meal, think of these babies. They are easy to make (note the very few ingredients), are so tender but slightly crisp on the outside, and they have much more than a twist of lime in them to add to your meal’s happy ending. Now, for those of you who have limited time and limited patience (you know who you are), please scroll forward to the recipe if you are ready to whip these babies up, BUT if you would like to be part of the festivities of celebrating a couple of blog awards that two lovely ladies with two fabulous blogs I follow regularly have bestowed upon me, then please feel free to read on…and let’s go ahead and toast our margaritas to them as well. 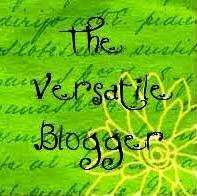 There are rules to the Versatile Blogger Award so here goes it…. 3. Spread the love to 15 other blogs that you think deserve the award and contact them to let them know you gave them the award! 1. I am very happily married for almost twenty years to my high school sweetheart and have two amazing kids. 2. I am a dog-a-holic….I adore dogs and especially my own, Sadie. She rocks my world. Please check out my crazy decked out dalmation minivan if you need to be convinced. 3. Reading is one of my top five things to do when I have time for myself (HA! What that is I will NEVER know!). I am currently reading…The Immortal Life of Henrietta Lacks (please check it out…it’s really eye opening) but should be reading, The Art of Racing in the Rain since my bookclub meets next week and I am one whole book BEHIND! 4. My favorite souvenir I bought on a trip is my set of Mickey Mouse measuring spoons I got from Disneyworld. Mickey Mouse and baking both make me very happy and how nice of them to wrap it up in one adorable set of spoons. 5. I am an early riser and wake up most mornings without an alarm clock at 5:30 a.m.
6. Chocolate and I are besties, bff’s, soulmates. You get it. 7. I have an addiction to taking photos of my food. It’s weird and I need to get over it. Blogging is not my life…say it again folks…blogging is not my life. Is there a support group for this? If so please forward any info! Here is the hard part friends…nominate 15 other bloggers with these awards. Truly, I adore an encyclopedia full of blogs, but I thought this time I would mention a few new ones I am following. 1. Sinfully Spicy – Tanvi’s photos make me drool for two reason, their quality and excellence and the deliciousness of the food! 2. The Little Spork – Lianna is a college student who cooks up a storm and I am always amazed at her repertoire at such a young age. 3. Offally Tasty – Cali is definitely a soul sister of mine since we seem to crave, bake and cook many of the same things. 4. Simple Math Bakery – I have been won over by so many of Jeanne’s delicious items and I absolutely LOVE that she made a pie in the shape of a “pi” for National Pi day. Her name is pretty awesome too. 5. Ang Sarap – Raymund is an IT guy but you would assume he is a chef from his amazing food. His pork steamed buns are top on my to-do list. 6. Eats Well With Others – Joanne is definitely swaying me to the healthier side of eating although you might not guess it from my blog. Her photos and food are exquisite. 7. The Spinning Plate – Her writing and food are both thoughtful and illuminating. If you follow her blog, then you can say, “I knew her when” before she becomes a famous author. Preheat your oven to 350 degrees Fahrenheit. Line two baking sheets with Silpat mats or parchment paper. In the bowl of a stand mixer fitted with a paddle attachment, beat together the butter on sugar on medium speed. 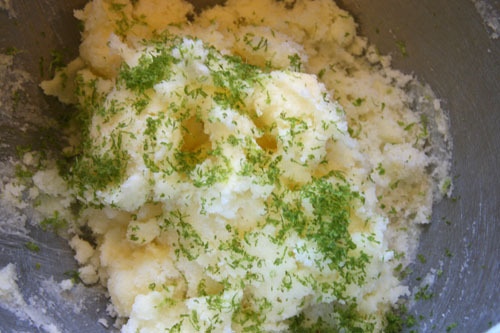 Add the lime zest, egg yolks and lime juice and combine. Then add your sour cream or Greek yogurt and combine on low until just incorporated. In a medium-sized separate mixing bowl, whisk together the flour through salt. —*Bakers hint: When measuring flour it is NOT a good idea to use your measuring cup as a scoop, this packs your flour in too tight and you will use too much flour. Instead, lightly spoon flour into your measuring cup. Add the dry ingredients to the butter mixture and combine on LOW speed until just mixed in. Don’t over mix. Place your 1/2 c. of sugar in a small bowl. Using an ice cream scoop, scoop out balls of cookie dough and roll them in the sugar and then place on the cookie sheet OR leave off the excess granulated sugar and after they are baked sift powdered sugar on top. Bake for 12-14 minutes or until slightly golden on the outer edge. The cookie should be just a little bit firm when touched lightly. If you did not use the granulated sugar on top of your cookies, then sift powdered sugar on top of them while they are still warm. This will help the powdered sugar stick onto the cookie. Enjoy! Aww! Thanks Geni! I need to send this award out! And, by the way, not only do we seem to like the same food, but the same books! The Immortal Life of Henrietta Lacks is fantastic- I read it a couple of months ago! Congratulations on your two Blogcademy Awards!! Yay for you on your awards! You deserve it. I’m going to check out all the blogs you listed. I make lime sugar cookies but also put coconut in them. Yum! Thanks for the mention, Geni! Scrumptious, as always. I, for one, do not underestimate the power of lime. Wish I had one of those cookies now. Oh hell I’ll take a margarita too. Me too Linds! Hope your week has been great! Ahh! Congratulations on your two awards, and thank you so much for thinking of (and nominating!) me 🙂 I will definitely be sending this award out in my next post! I’ve never had lime sugar cookies before, but yours looks and sound good enough to give them a try! Those cookies look great! 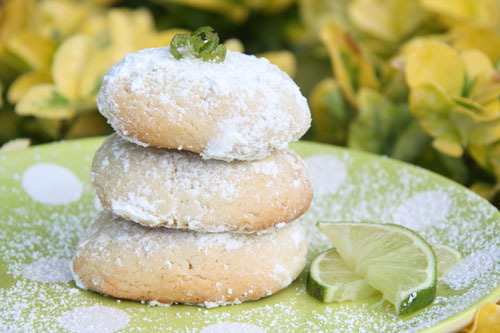 I have never heard of lime cookies before, but it sounds just perfect for Cinco de Mayo. These cookies sound awesome. I may just make them for my parents as kind of a “thank you for letting me and the dog stay here and take up your entire living room with all our junk” gift. Does it count if I use their groceries to make them? I love that you married your high school sweetheart. Stories like that make me happy. Geni, it looks great, I never had one with lime zest and lime juice before, it sounds heavenly. And the yogurt substitute for sour cream sounds good to me. We do have a lot in common. Food, books, dogs. N I will never understand how U wake up that early. Every time I read that I go into shock, I am a real lazy bone on that front. Congrats on the twin awards. Lime is definitely a beautiful beautiful thing…in cookies, in margaritas, whatever. Delicious. But. Especially cookies. These look awesome! Geni, Congrats on your awards! You and your blog are very deserving of these! It was nice to “learn” more about you too! We share many similarities, it must be why I enjoy reading your blog so much! And the cookies… yum! Congrats on your 2 blog awards! well deserved. you have such a wonderful blog and you are so great about keep up with your postings. BRAVO. The cookies look yummy too, I ways enjoy a sweet and tart treat. Congrats on your awards–you totally deserve them! And the cookies look great! (unfortunately I can’t make them because of the alcohol content, but they’re nice to look at too) 🙂 I’m familiar with only 3 of the bloggers you mentioned, I will have to pay the other ones a visit! Your cookies look wonderful! Lime in anything is fabulous. I love Simple Math and Eats Well, and I’m looking forward to checking out some of the other blogs. Congratulations and thank you for sharing it with me Geni.So sweet of you. How much I love lime..these cookies are calling out my name.I always prefer lemon over lime simply coz of the extra tang!These look so so wonderful! These would be fabulous with substituting lemon as well. You deserve the awards Tanvi! Love those cookies. And I love the Little Spork. Can’t wait to check out the rest of your list. I’m a dog-aholic too by the way. So glad you have stopped by. These cookies are right up my alley! I love lemony-limey desserts. Great news about your awards! Congratulations on your awards and thanks for sharing these delicious looking cookies! I would have never thought to put a fruit flavor like lime in a cookie, but I love the idea! Thank you for sharing this and inspiring me with something new. Have a great weekend. On another note – these cookies look phenomenal! Margarita cookies?! Sounds like the best type of cookie ever! These cookies look absolutely amazing! I really want to try this recipe! Congrats on the awards, you totally deserve it and those cookies look very tasty! Happy Mother’s day to you!!!Enjoy! Anyways Happy Mothers day! and I am flattered being on that list.